Sherlock Holmes is the most portrayed fictional character of all time, and he has been reimagined by actors, playwrights and directors over centuries - but who is the creator behind the detective? Arthur Conan Doyle’s own life was often stranger than fiction, and his most famous characters’ stories and personalities bear more than a passing resemblance to his own life and his closest friends. Biographer and broadcaster Lucinda Hawksley gains unprecedented access to a treasure trove of Doyle’s never-before-seen personal letters and diaries. This is a chance for Sherlock fans to see their detective hero and his creator as they’ve never seen them before. Through interviews with Doyle aficionados, academics, actors and family members, we explore Doyle’s travels and sailing adventures across the globe, his pioneering work as a doctor, his life in the Freemasons and his fights against miscarriages of justice. As well as his many triumphs, we will also explore the challenges he faced, from the death of his first wife and son to the initial rejection he faced as an author. We will also look beyond Sherlock to Doyle’s other great works including his fantasy and science fiction novels and hear how one of his most famous - The Lost World - part-inspired Michael Crichton’s book of the same name, which became the successful Jurassic Park film franchise. 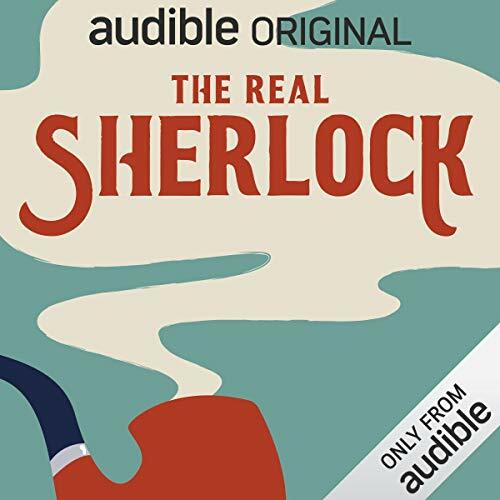 As an Audio Show - free for members - when you add The Real Sherlock to your library, you'll get all 6 episodes, each with a runtime of about 25 minutes. This series has too much repitition of the same facts. We'll hear snippets at the end of one episode as a trailer to the next. That is then repeated at the top of the next episode as a preview to what's to come and finally we hear it in context, by which time one is so familiar with it one can repeat it along with the broadcast. This also means that valuable time where new info and insights could be aired are not forthcoming. Truly significant moments in Doyle's life, his decision to resurrect Holmes, his work on real cases of injustice, his hatred of his character are speedily glossed over resulting in a thumbnail which has no illuminating quality. It is however entertaining to see how many clichés the presenter can squeeze into her linking narrative. In short, a disappointing shallow series made all the more frustrating because the source material offers so many opportunities that none of the production team exploit. I am enjoying this series immensely. Including members of The Doyle family, their remembrances, discoveries and family material, brings them all alive as people. If you are Interested in Doyle, Holmes or Bell, this is well worth a listen. honestly whoever edited this series should find a different job.. half of each episode is made up of clips of what we are about to hear ,what will be in the next episode, introduction and credits and unfortunately whats in between is very weak with little substance. Not enough of real interest here. Lots of repetition in the form of 'what's coming up' in the next 1/2 hour. Would have made a reasonable hour long program with careful editing. Fascinating insights into Cohen-Doyle however there is only about one episode worth of interesting material, the rest of the series is filler and repeating what has already been said. While listening to the last episode I had to double check twice I wasn't listening to an earlier episode given the amount of repetition. There are a huge number of people who love the Sherlock stories (me amongst them) and so there will be lots of interest in a series that reveals the back story on his development. This is not it. Apart from some vacuous gushing over Conan-Doyle's nightshirt, the rest of the content are some bland platitudes from actor Bill Patterson and a cosy chat with two of Doyle's descendants. I am searching my mind as to whether I learned anything at all about Sherlock from this. If this had not been free, I would have sent it back. We don't need to hear the same clips 3 times, particularly for such short episodes. Great subject matter but tediously repetitive. Each episode told you what it would tell you, told you it, repeated it, then repeated it some more. Pandering to a market with a short attention span perhaps?! I was expecting so much more! For such a literary genius, the content is actually quite disappointing. I listened to two episodes and I think that was quite enough.